In May, I was rather taken aback by a phone call from Vicky of Grosvenor Shows to inform me that I had been awarded the above cup for “Services to Quilting” which was to be presented at the May Malvern Show. My immediate responses were “Why me?” Are you sure? How? Why? I am not famous enough! Realising I was not going to get a satisfactory response to any of these questions or comments, I was told that Vicky was just the messenger and that the decision was made on an annual basis by Di Huck who founded Quilts UK and the magazine ”Patchwork and Quilting” but who had sadly died in the early spring. Furthermore I was told that because of this, it was the last time the award was going to be made and a member of Di’s family had specifically requested to make the presentation. Spruced up – well as best I shall ever get to be I hitched a lift to the last day as I had come hot foot from the Quilters’ Guild regional co-ordinators’ training event in York, and humbly accepted the award. I knew that this consisted of a cup but what I had not bargained for was a suitcase which the winners have contributed to over the years. I had to arrange a separate lift back for this to Exeter as there was no room in Jeanne and Boyce Stetson’s car. Being as I have been very busy finishing a large set of 6 banners for a local church, not to mention being up to my eyeballs with preparation for Exeter Quilters’ Exhibition in August and arrangements for Pat Cox’s annual visit with accompanying picnic and a week of workshops in the house, I have yet to open this suitcase for fear of losing any more sleep. I am saving this surprise for the 18th August when I might be able to get my head around what my contribution might be. As this is the last year of the award, I will write up what the contents of this suitcase consist of in part 2. In the meantime, I remain mystified as to how I came by this award. Enquiries with the P and Q office only revealed that “they have a book on me”. Guess the tendrils of GCHQ go a lot further than any of us might realise! I know that I was very busy in the eighties being an early member of the Quilters’ Guild and have done my stint as an area rep and currently am co-ordinator for region 4. I was also a very early member of South West Quilters and organized the workshops for 15 years along with being chairman for 2 years in the nineties. I was instrumental in starting Exeter Quilters and was chairman of that for 20 years. I have my home group, called “The Perfect Circles “ and help Jeanne Stetson run a block of the month hand applique project for a group of people who like to follow the patterns and teaching methods of Pat Cox from Minnesota. However, I do not consider any of these activities as being unusual and know of many more people who have worked a lot harder or with greater prominence or made a greater impact to promote P and Q at local, national and international levels. 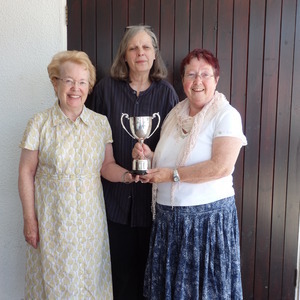 Our summer day speaker, Barbara Chainey, was the first winner in 1999 ; in 2005 the cup went to Peggy Stewart MBE and in 2009, Jeanne Stetson. I am proud therefore to be named as the final recipient and humbly acknowledge the honour on behalf of all the other Indians who work tirelessly to make things happen and keep the ball rolling for both groups and individuals wherever they might be. 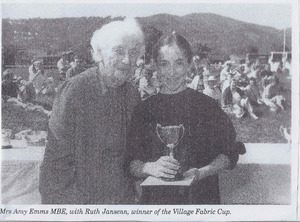 I am also tickled by the fact that I have a treasured photo of the late Amy Emms MBE presenting my 13 year old daughter, Ruth, with the Young Quilter’s cup at Quilts UK in 1992 (pictured).